Oracle Enterprise Manager Cloud Control (Cloud Control) enables you to manage Oracle Data Redaction policies and formats. Oracle Enterprise Manager Cloud Control provides an unified user interface for creating and managing Oracle Data Redaction policies. 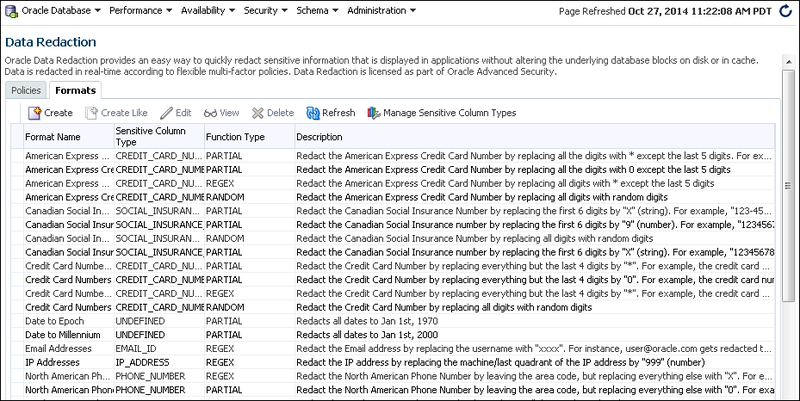 Create and manage sensitive column types directly from the Oracle Data Redaction pages. While you create a Data Redaction policy, Cloud Control uses sensitive column types to obtain the Oracle Data Redaction formats that are relevant to the column that you are redacting. You can redact data in Oracle Database Enterprise Edition 11.2.0.4 or later by using Oracle Enterprise Manager, starting with Oracle Enterprise Manager 12c. However, before you can create custom redaction formats and sensitive column types, you must deploy the Enterprise Manager for Oracle Database plug-in 12.1.0.7 or higher. For information about how to deploy a plug-in, see Enterprise Manager Cloud Control Administrator's Guide. First, you should create sensitive column types and formats if necessary, and then create the Oracle Data Redaction policy afterward. 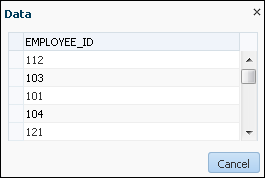 (Optional) If you want to map the database columns (that contain the data that you want to redact) to new sensitive column types, then create the required sensitive column types as described in Management of Sensitive Column Types in Enterprise Manager. (Optional) If you want to redact the data (present in a particular database column) using a custom redaction format, then create the required redaction format as described in Creating a Custom Oracle Data Redaction Format. Create an Oracle Data Redaction policy for the required database, as described in Creating an Oracle Data Redaction Policy Using Enterprise Manager. When you create an Oracle Data Redaction policy, it is enabled by default. For information on how to disable an enabled redaction policy, see Enabling or Disabling an Oracle Data Redaction Policy in Enterprise Manager. A sensitive column type categorizes table column sensitive information into a sensitive information type, such as credit card numbers. Sensitive column types use a combination of the column name, column comments, and the data pattern defined using a regular expression to tag a column to a particular sensitive information type. While you create Oracle Data Redaction policies, redaction formats are filtered on the basis of the chosen sensitive column type, thus saving time and effort. For example, if the database table column that you want to redact contains U.S. Social Security numbers, and you select the SOCIAL_SECURITY_NUMBER sensitive column type for the column while adding it to the Oracle Data Redaction policy, the default redaction formats that you can use to redact the column data are filtered, and only the relevant redaction formats are displayed. Figure 11-1 illustrates the filtering of Oracle Data Redaction formats based on sensitive column types. Description of "Figure 11-1 Oracle Data Redaction Formats Filtered on the Basis of Sensitive Column Types"
This functionality is available only if you have the Enterprise Manager for Oracle Database plug-in 12.1.0.7 or later deployed in your system. For information on how to verify the plug-ins deployed in your environment, see Enterprise Manager Cloud Control Administrator's Guide..
As part of the Application Data Modelling feature, Oracle provides a number of default sensitive column types that a database column can be mapped to. Figure 11-2 displays some of the default sensitive column types. Description of "Figure 11-2 Default Sensitive Column Types"
If none of the default sensitive column types are suitable for the database column that contains the data that you want to redact, you can create a new sensitive column type, or create a sensitive column type that is based on an existing sensitive column type, as described in Oracle Database Testing Guide ..
Oracle Data Redaction provides redaction formats that can be used directly within a redaction policy to redact data. The Oracle Data Redaction formats are used for commonly redacted data, such as ID numbers, credit cards, or phone numbers. Oracle Database provides several default Oracle Data Redaction formats. Figure 11-3 displays the default Oracle Data Redaction formats. Description of "Figure 11-3 Default Oracle Data Redaction Formats"
Each default Oracle Data Redaction format consists of a specific redaction function that determines the redacted output when the redaction format is used in an Oracle Data Redaction policy. 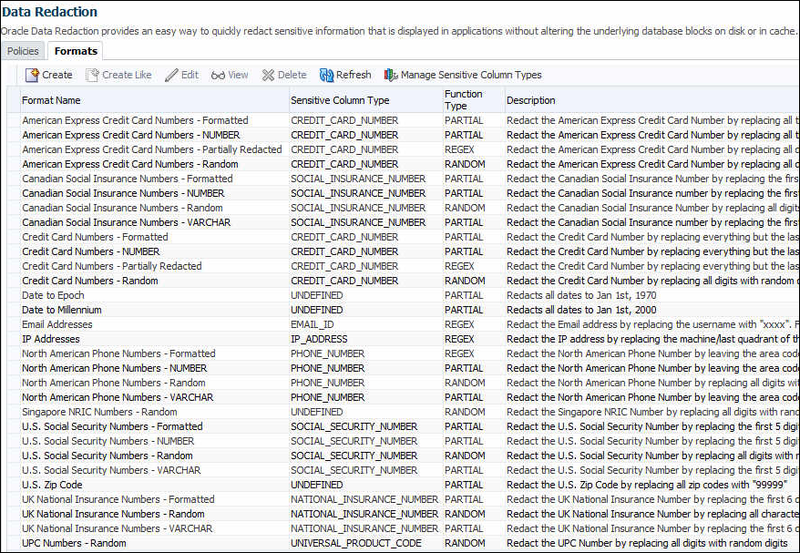 For example, the Credit Card Numbers - NUMBER default redaction format replaces the first twelve digits of the column data with the digit 0, when it is used in an Oracle Data Redaction policy. That is, if the column data is 5555555555554444, the redacted output will be 0000000000004444. If you have deployed the Enterprise Manager for Oracle Database plug-in 12.1.0.7 or higher on your system, then you can also create and save custom redaction formats, which you can then use in your redaction policies. You can create and save custom Oracle Data Redaction formats using Enterprise Manager Cloud Control. Log into Oracle Enterprise Manager Cloud Control as either user SYSTEM or SYSMAN. Select Search List, then click the name of a database target. On the home page of the database target, from the Security menu, select Data Redaction. Log in to the database, if you are prompted to do so. Ensure that you log in to the database as a user that has the EXECUTE privilege on the DBMS_REDACT PL/SQL package. Select the Formats tab and then click Create. If you want to create a custom redaction format that is based on, or is similar to an existing redaction format, then click Create Like. Provide a name and a description for the redaction format that you want to create. If you want to map the redaction format to a particular sensitive column type (such that the created redaction format can be used to redact the data of a column that is associated with the sensitive column type), then select a value for Sensitive Column Type. Select the function that the format should use to redact the column data. 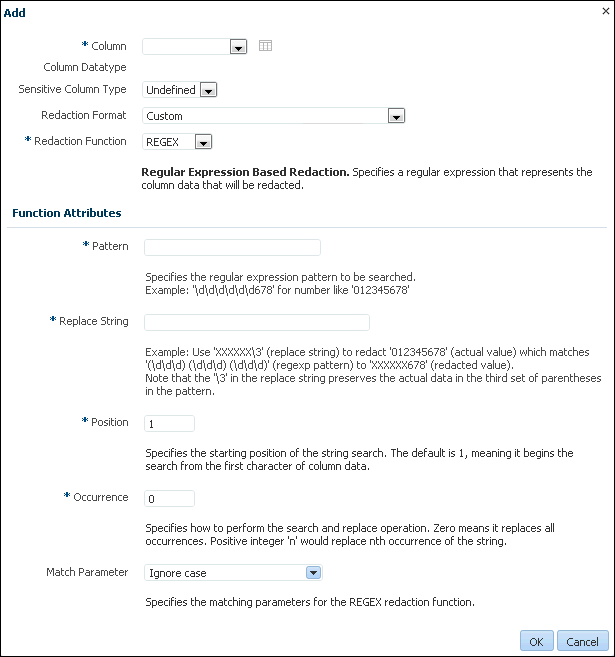 For Redaction Function, select FULL if the format should redact the entire column data, PARTIAL if the format should redact only a part of the column data, REGEX if the format should redact data based on a regular expression, RANDOM if the format should redact data in a random manner, using randomly generated values, or NONE if the format will be used to only test the definition of a redaction policy, and not redact any column data. If you select PARTIAL, then ensure that you provide the function attributes, as well as the data type that you want to use the redaction format for. If you select REGEX, ensure that you provide the function attributes. 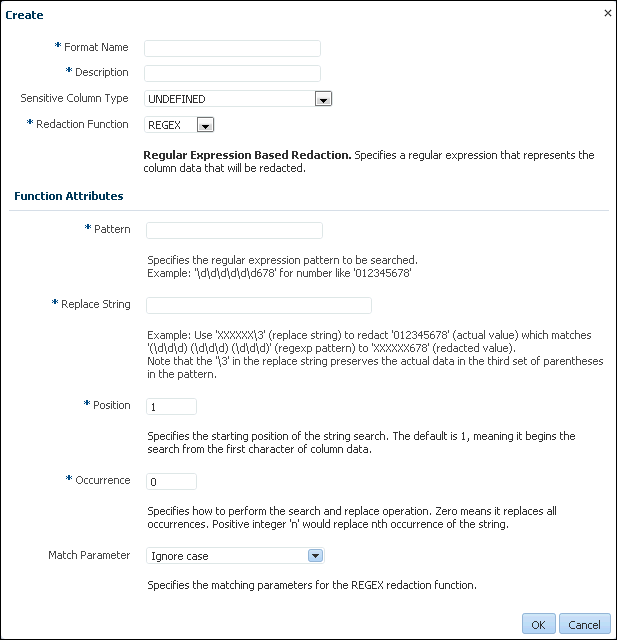 For more information about the redaction functions you can use, and the patterns you can specify with each redaction function, see Oracle Data Redaction Features and Capabilities. Click OK to create and save the custom redaction format. This format can now be used to create a redaction policy. For information about how to create a redaction policy, see Creating an Oracle Data Redaction Policy Using Enterprise Manager. You can edit custom Oracle Data Redaction formats using Enterprise Manager Cloud Control, but not in SQL*Plus. Select the custom redaction format that you want to edit, and then click Edit. (Optional) Choose to edit the format description, sensitive column type, redaction function, and the redaction function attributes. Click OK to save the edited format. Enterprise Manager Cloud Control displays the details of the Oracle-supplied and custom Oracle Data Redaction formats. Select the required redaction format, then click View. The Data Redaction Formats page appears, similar to the following page. You can delete a custom Oracle Data Redaction format using Enterprise Manager Cloud Control (Cloud Control). You can only delete custom Oracle Data Redaction formats, and not the redaction formats that are provided by Oracle. Select the custom redaction format that you want to delete, and then click Delete. In the Confirmation dialog box, click Yes or No. You can create, edit, view, and delete Oracle Data Redaction policies in Enterprise Manager Cloud Control (Cloud Control). Use the Data Redaction page in Cloud Control to manage Oracle Data Redaction policies. To redact the data present in a particular database table or view column, you must create an Oracle Data Redaction policy. Data is redacted using a redaction format that is specified by the Oracle Data Redaction policy. To redact data, you can use any of the Oracle-supplied redaction formats, or create and use a custom redaction format. If the table or view column that contains the data that you want to redact is mapped to a sensitive column type, Oracle uses the mapping to recommend suitable redaction formats for the data. Thus, Oracle Data Redaction policies encapsulate database schemas, database table and view columns, sensitive column types, and Oracle Data Redaction formats. Figure 11-4 shows the Data Redaction page, which enables you to create and manage Oracle Data Redaction policies in Cloud Control. Description of "Figure 11-4 Oracle Data Redaction Policies Page"
You can create an Oracle Data Redaction policy using Enterprise Manager Cloud Control. Select Search List, then click the name of a database target for which you want to create an Oracle Data Redaction policy. In the Policies section of the Policies tab, select Create. Schema: Enter (or search for) the name of the schema that contains the data you want to redact. Table/View: Enter (or search for) the table or field that contains the column you want to redact. Policy Name: Enter a for the policy, such as emp_wages_pol. In the Object Columns section, click Add to add a table or view column to the redaction policy. The redaction policy is applied only on the table or view columns that are added to it. From the Column menu, select the table or view column to which you want to apply the redaction policy. To the right of the Column menu is an icon that you can click to view the contents of the selected column. If the column contains sensitive data and has been mapped to a sensitive column type, then from the Sensitive Column Type menu, select the sensitive column type that it has been mapped to. If the search pattern in the Sensitive Column Type menu matches, then the sensitive column type is selected by default. For example, for a column listing credit card numbers, if there is a match, then the menu will list Undefined and CREDIT_CARD_TYPE. If there is no sensitive column type created, then the default Sensitive Column Type menu listing is only Undefined. From the Redaction Format menu, select the redaction format that you want to use. The drop-down list is populated with the Oracle Database-supplied redaction formats, as well as the custom redaction formats that you have created and saved. For information about how to create and save a redaction format, see Creating a Custom Oracle Data Redaction Format. If you do not want to use a pre-defined redaction format (that is, an Oracle-Database supplied redaction format, or a custom redaction format that you have created), and instead want to specify the redaction details while creating the redaction policy, select CUSTOM for Redaction Format. The Add dialog box adjusts to accommodate the type of redaction format and function that you select. For example, if you select the CUSTOM redaction format and the REGEX redaction function, then the Function Attributes region appears in the dialog box. From the Redaction Function menu, select the function that you want to use to redact the column data. Select FULL if you want to redact the entire column data, PARTIAL if you want to redact only a part of the column data, REGEX if you want to redact the column data based on a regular expression, RANDOM if you want to redact the column data in a random manner, using randomly generated values, or NONE if you only want to test the definition of the redaction policy, and not redact any column data. Note that all the redaction functions may not be applicable for a particular redaction format. The drop-down list displays only the redaction functions that are applicable for the selected redaction format. If you selected CUSTOM for Redaction Format in the previous step, and PARTIAL or REGEX for Redaction Function, ensure that you specify the function attributes. See Oracle Data Redaction Features and Capabilitiesfor more information and examples of the available redaction formats. Repeat these steps starting with Step 8 for all the columns that you want to add to the redaction policy. On the Create Data Redaction Policy page, click OK to create the data redaction policy. You can edit an Oracle Data Redaction policy using Enterprise Manager Cloud Control. Select Search List, then search for and click the name of the database target for which the Oracle Data Redaction policy that you want to edit was created. In the Policies section of the Policies tab, select the redaction policy that you want to edit, then click Edit..
On the Edit Data Redaction Policy page, choose to edit the policy expression, add new columns to the redaction policy, modify the redaction details of a column that is a part of the policy, or delete a column from the redaction policy. To add a new column to the redaction policy, in the Object Columns section, click Add, select the table or view column that you want to add, then specify the redaction details. To modify the redaction details of a column that is a part of the policy, select the column, click Modify, then edit the redaction details. To delete a column from the redaction policy, select the column, then click Delete. 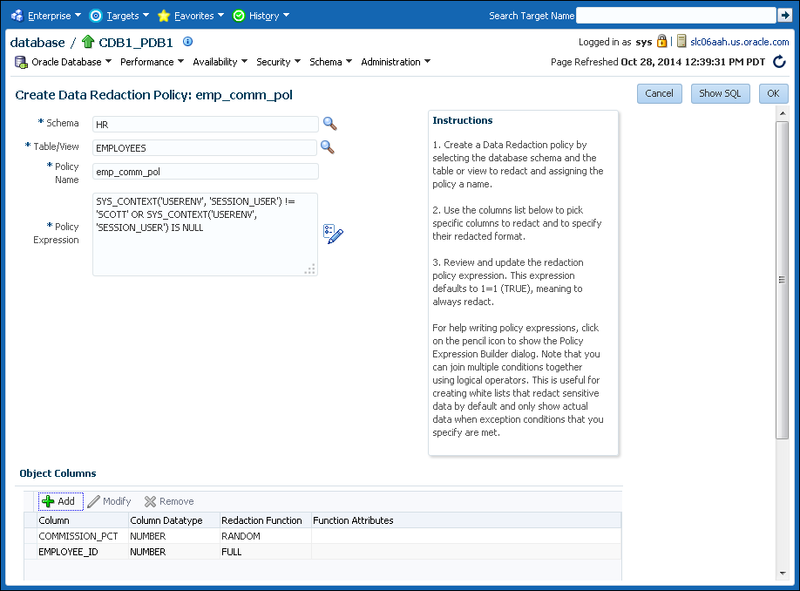 For information about how to specify or edit the policy expression, see Step 6 described in Creating an Oracle Data Redaction Policy Using Enterprise Manager. For information about how to specify or edit the redaction details of a column, see Step 7. On the Edit Data Redaction Policy page, after editing the required fields, click OK to save and enable the edited redaction policy. You can find Oracle Data Redaction policy details such as whether the policy is enabled by using Enterprise Manager Cloud Control. You can disable an enabled redaction policy, or enable a disabled redaction policy using Enterprise Manager Cloud Control (Cloud Control). Select Search List, then search for and click the name of the database target for which the Oracle Data Redaction policy that you want to view was created. Select the name of the policy in the table. Select the required redaction policy, then click View. An Oracle Data Redaction policy is executed at run time only if it is enabled. When you create an Oracle Data Redaction policy, it is enabled by default. Select Search List, then search for and click the name of the database target for which the Oracle Data Redaction policy that you want to enable or disable was created. In the Policies section of the Policies tab, select the redaction policy that you want to enable or disable, and then click Enable or Disable. You can delete an Oracle Data Redaction policy using Enterprise Manager Cloud Control. Select Search List, then search for and click the name of the database target for which the Oracle Data Redaction policy that you want to delete was created. In the Policies section of the Policies tab, select the redaction policy that you want to delete, and then click Delete.